The summer 2016 issue of Journal of the History of the Behavioral Sciences is now online. Articles in this issue explore investigations of Palladino’s mediumship, Alfred Binet’s collaboration with instrument makers, the historiography of psychology textbooks, and central figures in psychological and philosophical associations at the turn of the twentieth century. Full titles, authors, and abstracts follow below. In 1888, the spiritist Ercole Chiaia challenged Cesare Lombroso to go to Naples and study a brilliant though still unknown medium: Eusapia Palladino. At that time Lombroso turned down the challenge. However, in 1891 he became fascinated by the medium’s phenomena. Despite the abundant literature on Palladino, there is still an episode that needs to be explored: in 1888, the Spanish doctor Manuel Otero Acevedo accepted the challenge rejected by Lombroso, spent three months in Naples studying the medium and invited the Italian psychiatrist to join his investigations. This unexplored episode serves to examine the role of scientific authority, testimony, and material evidence in the legitimization of mediumistic phenomena. The use Otero Acevedo made of the evidence he obtained in Naples reveals his desire to proclaim himself an authority on psychical research before other experts, such as Lombroso, Richet, and Aksakof. The April 2012 issue of History of the Human Sciences is now online. This month’s issue is a special issue, guest edited by Elizabeth Valentine, on the topic of parapsychology, occultism, and spiritualism. The eight all new articles in the issue explore the history of psychology’s relationship to spiritualism and other occult matters across the globe; most specifically in the Netherlands, the United States of America, Germany, Britain, France, Spain, Hungary, and Japan. 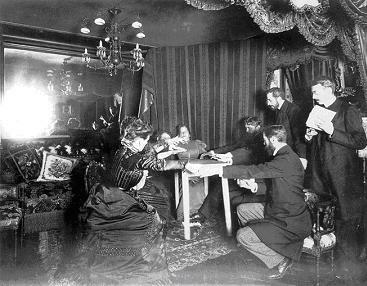 (Pictured above is medium Eusapia Palladino, the subject of one of the issues articles, in a seance in 1898.) Full titles, authors, and abstracts follow below. One of the reasons the history of parapsychology and its ancestor psychical research is intriguing is because it addresses a central issue: the boundaries of science. This article provides an overview of the historiography of parapsychology and presents an approach to investigate the Dutch history of parapsychology contributing to the understanding of this central theme. In the first section the historical accounts provided by psychical researchers and parapsychologists themselves are discussed; next those studies of sociologists and historians understanding parapsychology as deviant and even potentially revolutionary are dealt with; third, more contemporary studies are examined whereby enterprises such as parapsychology are understood as central to the culture in which they arose. On the basis of this analysis a new direction in the historiography of the subject is suggested in the fourth section, centred upon the relation between parapsychology and psychology in the Netherlands throughout the 20th century. In the Netherlands not only were pioneering psychologists such as Gerard Heymans (1857–1930) actively involved in experiments into telepathy, the first professor in parapsychology in the world – Wilhelm Tenhaeff (1894–1981) – was appointed in 1953 at Utrecht University and in the 1970s and 1980s parapsychology had its own research laboratory at Utrecht University in the division of psychology. This unique situation in the Netherlands deserves scholarly attention and makes an interesting case to investigate the much-neglected connections between the fields of psychology and parapsychology in the 20th century. The connections between psychology and parapsychology might help us to understand why parapsychology came to be regarded as a pseudoscience.